The Huisinis project came about by an approach from the Huisinis crofters. Each summer a huge number of visitors are attracted by the beach at Huisinis. This brings with it many issues, like overflowing rubbish bins, vehicles eroding the machair and vehicles restricting resident’s access. 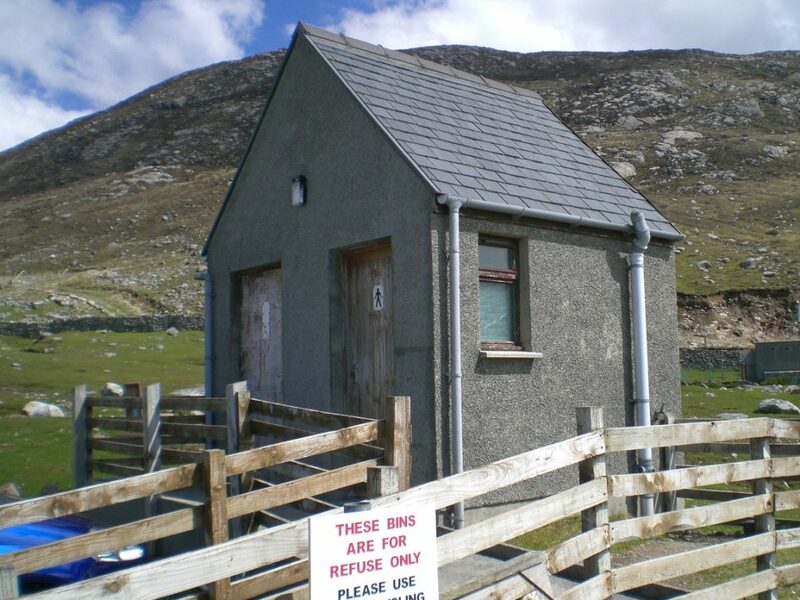 The existing public toilets are now owned by NHT and are in need of modernisation. This project aims to address some of the summer issues whilst building a new modern facility. The project will demolish the existing building and replace it with a new timber frame/clad building (see documents below). In addition to toilets, a changing room and showers will be incorporated. We have a letter of support from Lewis and Harris Youth Club that operates Coasteering sessions at Huisinis. There will also be a multi-use indoor space. This will have large windows to the hills and sea for winter visitors seeking shelter. It will include interpretation panels to educate visitors about the precious machair landscape, the existing wind turbines that power the building and some gaelic culture. Outside the building there will be much-improved parking. A formal parking area for campervans will include electric hook-ups. Water and a waste dumping point will also be available. In 2013, NHT commissioned a Feasibility Study. A township meeting was held to pull together thoughts, and consultations took place with SNH and CnES. Planning permission was granted in 2014, then the search for funding got underway. In 2016 CnES CCGF and LEADER funding was secured. With a contribution from HIE and the Trust itself, the required £270K budget was completed.